During his long career as an academic and researcher in nineteenth century France, Antoine Béchamp was widely known and respected as a teacher, an academic, and a researcher. As a leading academic, his work was well documented in scientific circles. Few made as much use of this fact as Louis Pasteur, who based much of his career on plagiarising and distorting Béchamp’s research. In doing so, Pasteur secured for himself an undeserved place in the history of medical science. The Blood and its Third Element is Béchamp’s explanation of his position, and his defense of it against Pasteur’s deceptions. This final major work of Béchamp’s embodies the culmination of his life’s research. This book contains, in detail, the elements of the microzymian theory of the organization of living organisms and organic materials. It has immediate and far reaching relevance to the fields of immunology, bacteriology, and cellular biology; and it shows that more than 100 years ago, the germ, or microbian, theory of disease was demonstrated by Béchamp to be without foundation. Schwerdtle, Cornelia, and Arnoul, Franz. Introduction into darkfield diagnostics. The examination of the native blood according to Prof. Dr. Gunther Enderlein.. (1993) Semmelweis-Verlag, D-27316 Hoya. This important 160-page book is published in Germany. 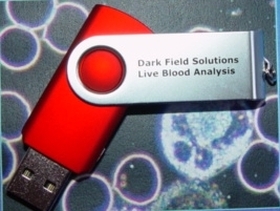 It contains in excess of 100 perfect photographic examples of the pathologic findings encountered during blood darkfield examination. I recommend this book for anyone planning to utilize this useful microscopic technique in managing your patient’s health. This represents one way to learn about excessive platelet aggregation and/or red blood cell rouleau. These conditions serve to make the blood significantly more viscous, and thus seriously impair oxygen delivery to the tissues. Platelet aggregometry testing and fibrinogen analysis are also extremely important tests in preventing needless deaths from hypercoaguable states. Unappreciated Friend or Unsuspected Foe? Dr. med. Maria M. Bleker – Unappreciated Friend or Unsuspected Foe? Selected and elucidated by Dr. med. Maria-M. Bleker. Maria Montserrat Bleker, née Monsó Capellades was born in 1931 in Barcelona. After successfully qualifying as a medical practitioner, she relocated to Germany where up until 1970 she worked for several hospitals and clinics as a junior doctor, scientific assistant and finally, as leader of the cytological laboratories of a large gynaecological university hospital. In 1964 she earned a degree in Germany as a medical practitioner, qualified as an anaesthetist in 1966 and finally received a doctorate shortly thereafter. In 1970 she left the hospital to establish her own laboratory for preventive cancer diagnostics which she gave up in order to fully concentrate in the direct treatment of patients, focusing in particular on darkfield diagnostics according to Enderlein, homeopathy, acupuncture and hyperthermy. During the seventies, the author took part in a training seminar for doctors where she met an old colleague whose professional focus was also set on homeopathy and naturopathy, who drew her attention to the scientific life work of the late biologist and zoologist, Prof. Dr. Enderlein. Since then, Dr. Bleker has dedicated her professional commitment intensively to the publication of his works. With the free access available to his notes, the author has written a comprehensive and concise script of Prof. Dr. Enderlein’s works, for which the main idea was to make his scientific results more approachable and understandable for interested doctors and other experts in related fields of science. Dr. Bleker’s main concern was, and still is, that Prof. Dr. Enderlein’s discoveries should not be ignored if we are to succeed in defeating chronological diseases, in particular cancer. Available here: Dr. med. Maria M. Bleker – Unappreciated Friend or Unsuspected Foe? Presently, dark field blood microscopy is the only way to observe live blood cells. Practitioners take a small amount of blood from a patient, apply the sample to a slide and observe the blood. Most blood-microscopes come equipped with a camera and video equipment, allowing both the practitioner and patient to view the specimen together.